Are you a beginning or professional grower? For this light it doesn’t matter. Read this Viparspectra 900W review and you’ll find out why. Viparspectra is a famous brand in the LED grow light market. It is well known for being an affordable solution for big grow rooms. The light has a variety of handy features that are useful for every grower. Find out why we love the Viparspectra 900W in our review. Actual marijuana growers developed the LED grow light, so they know what features and specs are needed. They tested and experimented years before releasing their first lights. The resulting flowers are bigger than you are used to with this great light. There are 180 LED chips in the Viparspectra 900W that have a lifespan of around 100,000 hours. The light is energy efficient as it only uses 418w to provide the light intensity equivalent to a 1000W HPS. The Viparspectra 900W even has a timer installed, so it’s easier to keep track and automate the process of turning the light on and off. To help the light stay cool there are 2 high-speed fans and an aluminum heat sink to lower the overall temperature. This helps in further extending the lifespan of the light. This way, the Viparspectra 900W runs 70% cooler compared to HID lights. The dimensions are 15.8×15.8×2.75” and it weighs in around 15.7lbs. The Viparspectra 900W is made in China and exported internationally. They sell directly via Amazon, on which they have a rating of 4.4 out of 5 stars. Viparspectra LED grow lights provide a full spectrum light, including UV and IR. It provides a well-balanced light spectrum; the plants thrive in the light, as it is similar to sunlight. The UV and IR look after the plant while they are in vegetation and blooming stages. The Viparspectra 900W is designed to provide a balanced PAR/Lumen result, which it does by having one of the highest PAR/Watt ratio and a great coverage. 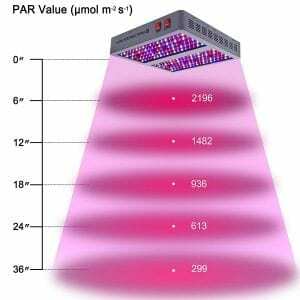 The LED grow light has a 90-degree angle that helps increase the coverage area. Viparspectra 900W also has two buttons that control the blooming and vegetation modes on the light. Vegetation mode helps the plants to grow healthy and blooming mode helps in fat and robust buds development. 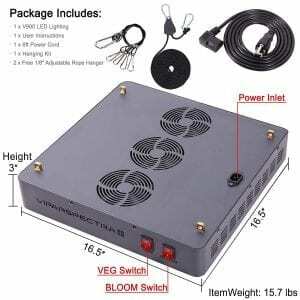 You hang the Viparspectra 900W LED grow light at a height of 28”. The light then gets the the ideal PAR value at the best coverage. This PAR value lowers as you deviate from the center. 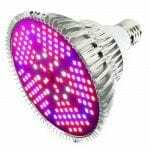 Hence, you should control the PAR value setting by either moving the LED grow light further or closer, using the automated timer or the dual vegetation or blooming mode switch. The PAR value also changes as the hanging height of the light changes. The design of this LED grow light is not entirely concentrated to the middle of the canopy of the plant. This results in stunted growth or burning of the plant. Lower height means higher PAR values. 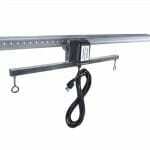 Coverage of 4x4ft can be achieved if the light is hung at 24 inches at the vegetative stage. This is 32 inches for blooming coverage of 3×3 ft. The LED grow light comes with hooks and wires to hang it a 6ft long power cord, and an instruction manual to guide you. The Viparspectra 900W has a 3-year long warranty and a 30-day money back guarantee. We have to mention that this light does not have high-quality materials. 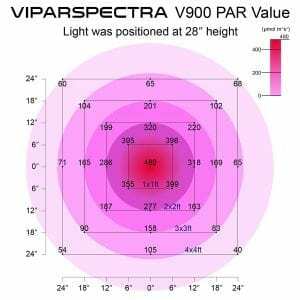 Viparspectra is well known for its affordability and high power lights, but this comes at a cost. Quality of the materials used is not that high as comparable lights in a higher price segment. The warranty and money back policy ensure peace of mind for the purchaser. 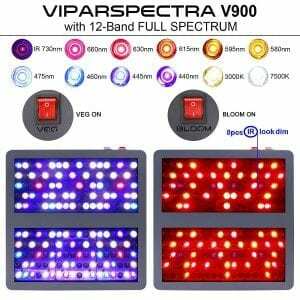 Viparspectra 900W is still a very good choice if high-end LED grow lights are out of your budget. Do you want to see this light in action? Check out the video below! 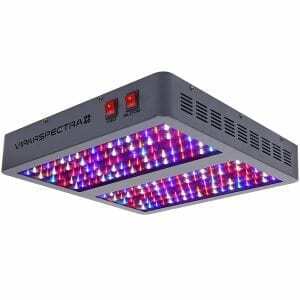 The Viparspectra 900W is a highly efficient and affordable LED grow light that has all the features you ever need for growing plants indoor. You probably won’t need any extra cooling or exhaust system with this Viparspectra LED light. If you’re growing on small scale, this light is probably too big for you. Consider one of their smaller lights in the Reflector Series. 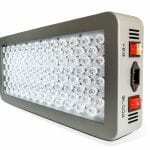 Therefore, if you want to purchase a plant growing light, make sure you consider this LED light. It gives great PAR values at a nice price, but keep in mind that the low price comes at a cost. The building quality is not as high as most comparable more expensive lights in the market. Read our full guide on how to buy the ideal LED grow light. Looking for a smaller version of this light? Check out the Viparspectra 300W and Viparspectra 600W in the Reflector Series. Are you looking for more tools to your growing operation? Read more on PAR Light Meters, Hydroponic Growing, Grow Tents and Nutrients & Fertilizers.